One of my earliest childhood memories is of slopping the pigs with Papa. He made everything fun and loved teaching us about caring for the land and animals. The smoke house is gone now but for years after he passed the smell of smoking meat wafted from the walls and ground of the smokehouse. 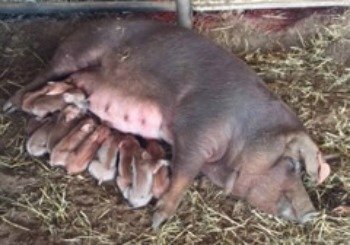 We recently talked about the best heritage breeds of pigs for your homestead. Now, let’s look at raising the breed you’ve chosen. Heritage breeds of pigs don’t require special housing or constant watching over. We’ve found they require less time and attention than any other livestock we’ve had. If they are provided pasture and forest for rooting and grazing, a place to drink, a place to make their wallows, and basic shelter for sleep, they pretty much fend for themselves. Pigs are pretty defenseless so we have to ensure their protection from predators but this is true of any livestock. Because pigs are freedom-loving creatures, they need strong boundaries. They don’t know about property lines or trespassing laws. They root and eat on the go so without a strong fence, even having them on a large piece of land won’t ensure they stay off the neighbors’ land. Depending on the size of your farm, one of the easiest ways to protect your livestock is with good fencing. Using livestock guardians along with fences offers the best predator protection. The right livestock guardian dog is worth their weight in gold. Like our grandparents, we also believe in using donkeys and mules as livestock guardians. This gives the livestock triple protection. Pigs are omnivorous, they’ll eat animals and plants. There isn’t much they won’t eat. Granny kept her slop bucket by the back kitchen door. Anything the dogs or chickens weren’t fed, the pigs got it. Pigs are amazing foragers, they root around for worms, insects, larva, and any other crawly thing. If it’s on the ground, it’s fair game. They’ll eat any grains, grasses, roots, fruit, practically anything. It’s common practice for pig farmers to turn their pigs out for “fattening” in the fall when the acorns and apples are on the ground. I learned from Papa it isn’t necessary to feed hogs commercial feed. He slopped his pigs and let them forage. When they’re rooting around, they get all their necessary minerals. If you talk with a commercial pig farmer or anyone who isn’t raising heritage breeds of pigs, they’ll say, “You have to give a pig corn to fatten them up.” The truth is No, you don’t. Corn will allow your pigs to grow and fatten quickly, but they won’t be getting nutrition, just fat. By free ranging and foraging your pigs, they’ll be naturally, healthy which means the healthiest, best tasting meat. A wallow is any hollowed out area with a water source. It can be man-made or pig made. Trust me, they will make their own wallow. A pig needs a wallow because they don’t sweat. They often choose shady areas for their wallows. They will thrive if you provide them a drinking source and a wallow. When a pig wallows, they coat themselves with mud. When the mud dries, it provides a shield from bugs and the sun. We tend to want to bathe our animals, but pigs can be left dirty and we can feel good about it! The dark color of the Large Black pig offers them some natural protection from the sun, but as dark attracts heat, a wallow is especially necessary for them. One old-timer offers her pigs a “shower” with an overhead sprinkler set up outside their shelter. Solar power runs the small pump which is on a timer. When it gets hot outside the system comes on and as the day winds down, it turns itself off. Her pigs love it! I think a regular ole garden sprinkler would accomplish the same thing. During the day, pigs will sleep all over the place but at night they like to have a dry, clean shelter to sleep in. You’ll find people house their heritage breeds of pigs in everything from dog houses to custom stalls. You don’t have to buy anything special for their shelter. All your shelter needs to provide is protection from the weather and predators and a clean dry place to sleep. We should make it clear that proper ventilation of any pig shelter is vital. Of course, this is true of any livestock housing, I just wanted to be sure to mention it to you. 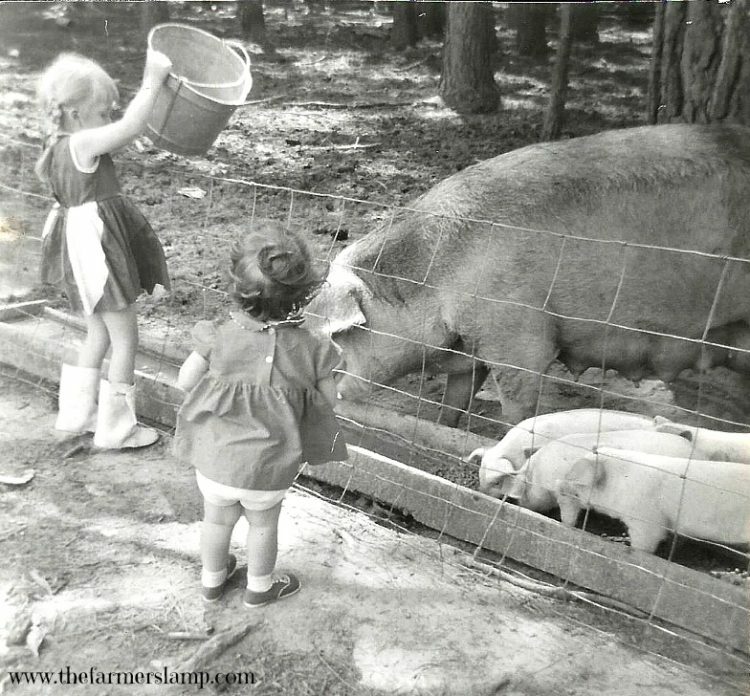 My husband was averse to getting hogs because of childhood memories of his grandfather’s pig pen. He said, “They stink too much!” My grandfather taught me if livestock poop is a stinky problem, then I’m mismanaging my farm. Any animal not provided a healthy living environment will smell. Did you know pigs are clean animals? At least as far as animal cleanliness goes. They will not use the bathroom where they sleep unless they’re not given any choice like in commercial pig farms. When given the option, pigs will delegate a specific area as their bathroom. All you’ll have to do is muck out that area. Free ranged pigs will use the bathroom as they go. The manure is managed by the elements which leaves the soil fertilized. This natural system creates a win-win for the pigs, the soil, and the farmer. Raising heritage breeds of pigs is not only an amazing way to keep the lines alive, it’s an amazing journey for you and those on your homestead. 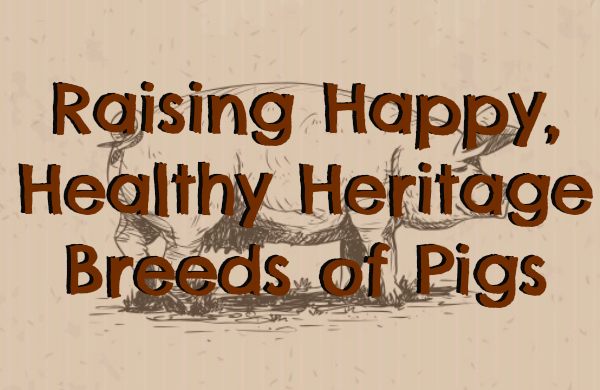 Do you raise heritage breeds of pigs? Please share your tips and experience with us in the comments below.